Happy Sunday, dear readers! It's a rainy one here in Northern California, and it certainly is welcome! While it isn't quite as dry here as it is in other parts of California, rain is always a welcome site. It has been wet the past three days, and while my toddler hasn't been the happiest being indoors, hopefully the rain has helped to replenish our reservoirs. If nothing else, it certainly will help perk things up around here, and the timing couldn't be more perfect for this blog post. Let's get to it! One of the brands I had the pleasure of discovering at Cosmoprof North America this summer was Allegresse Beauty. I always love finding skincare brands that make my skin feel luxurious, and this brand goes a step above by actually incorporating gold into their products for the true meaning of opulence! Gold has become a hot ingredient in skin care products due to its ability to reduce inflammation which can cause acne and hyperpigmentation. Gold is noted to have the ability to increase elasticity of the skin and prevent aging of the skin. While my main focus is on the health benefits of the skin, one cannot forget to mention the radiant glow gold gives the skin. Naturally it goes without saying that if you feel good, you look good too, but gold can add a touch of warmth to your skin that otherwise may not be present. 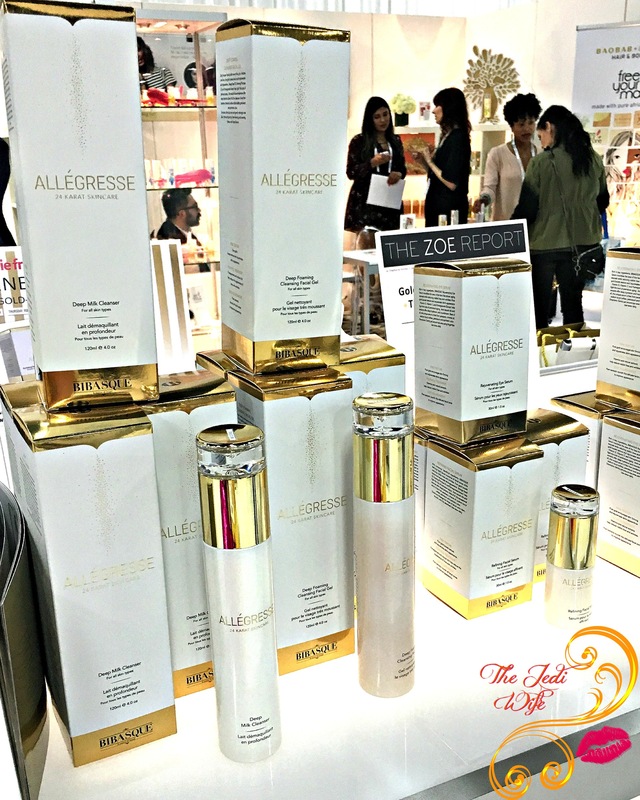 With all the benefits gold has in skincare, it is no surprising to see a gold-filled full skincare product lineup by Allegresse Beauty. Whether you want cleansers and exfoliators, masks, moisturizers, or eye care products, they have the luscious product you are looking for! 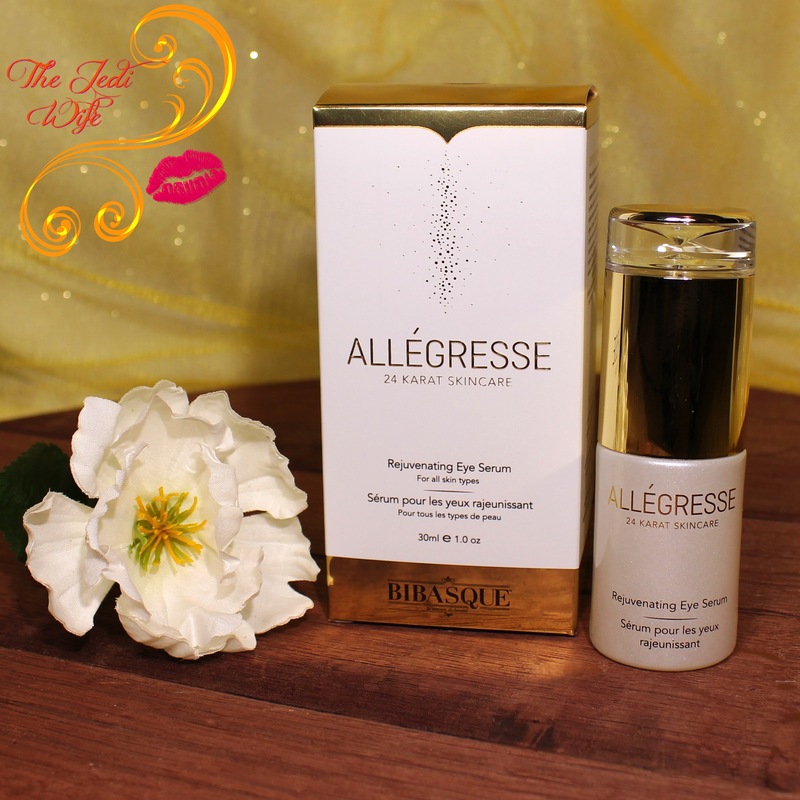 I had the pleasure of testing out Allegresse's 24 Karat Skincare Rejuvenating Eye Serum. Rich in key ingredients, Rejuvenating Eye Serum targets the area of you face that tends to show aging soonest by reducing visible lines and wrinkles. In addition to gold, it also contains Vitamin E, Vitamin C and pomegranate extract to help fight the look of premature aging. Part of the aging process is due to dryness, and this eye serum helps fight that with the addition of natural oils and extracts to provide deep hydration and nourishment to the delicate eye area. The Rejuvenating Eye Serum is applied twice a day, and I definitely saw a reduction in wrinkle depth at my eyes! I adore the feeling of this product going on my skin; it is silky and smooth, and the best part is it is free of the mineral oil, petroleum, and parabens often found in other skincare products! I was certainly impressed with this eye serum, and I definitely need to test out some of the other products! Maybe luck will find me one day and I'll win the lottery so I can have a sumptuous full gold-infused skincare routine. A girl can dream, right? Aqua (Water), Aloe Barbadensis Leaf Juice, Cucumis Sativus (Cucumber) Extract, Glycerin, Phenoxyethanol, Xanthan Gum, Anthemis Nobilis (Chamomile) Flower Extract, Punica Granatum (Pomegranate)Extract, Hamamelis Virginiana (Witch Hazel) Extract, Ocimum Basilicum (Basil) Leaf Extract, Simmondsia Chinensis (Jojoba) Seed Extract, Sodium Benzoate, Rosmarinus Officinalis (Rosemary) Leaf Extract, Cyclopentasiloxane, Salvia Officinalis (Sage) Leaf Extract, Triethylene Glycol, Oenothera Biennis (Evening Primrose) Oil, Fragrance (Parfum), Zingiber Officinale (Ginger) Root Extract, Ascorbic Acid, Borago Officinalis (Borage) Seed Oil, Tocopheryl Acetate, Gold (CI 77480). I am admittedly guilty of not always including the ingredient lists on my blog posts, but I did want to include the ingredient list for the Rejuvenating Eye Serum because so many natural ingredients are included. While I tend to be drawn to products that contain natural extracts and oils, some of them are allergens to people. As much as I would love for my readers to try out this product and fall in love with it like I have, I must urge caution (and more likely avoidance altogether) should you be allergic to any of these ingredients. I personally know a few people that read my blog that are allergic to rosemary and ginger so I'm afraid this may not be for those of you. The Rejuvenating Eye Serum and other gold-filled products are available for purchase at the Allegresse Beauty website located here. I'm eager to try out their moisturizing and face mask and have added them to my holiday wishlist! Have you tried any skincare products by Allegresse Beauty or other brands that incorporate gold into their products? What sort of products do you prefer that contain gold? I'd love to hear from you! I haven't tried this brand but it sounds so luxurious! I adore eye serums, and I love that hint of gold shimmer you can see in the product! I haven't tried this brand, but the ingredients look great! They are all nice and gentle. I'm obsessed with eye creams! Totally have to check this out. I haven't heard of this brand before but it looks great! Oooh this sounds so luxurious to me. I love eye serums. I've been looking for a serum like this so I'll have to try it. It sounds so lux and I definitely need the extra hydration.